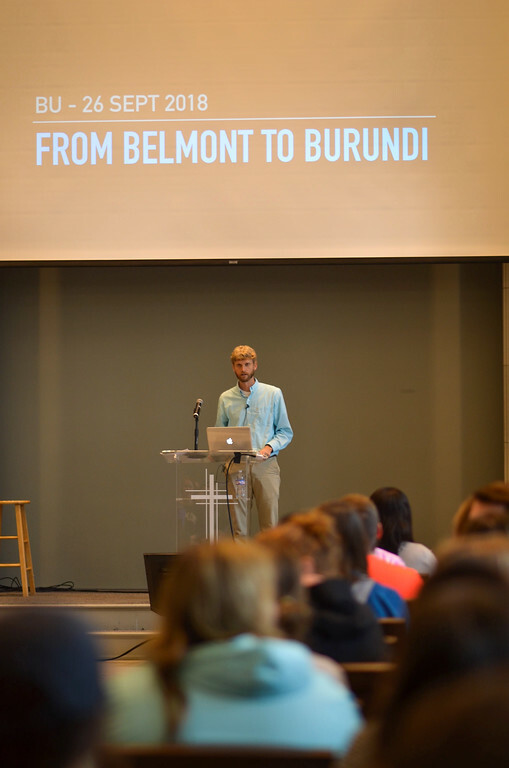 Dr. Eric McLaughlin, a Belmont alumnus, led a chapel focused on medical missions on Wednesday, September 26. He shared stories of his time in Burundi, his background in medicine and his thoughts on vocation. McLaughlin grew up in Smyrna, Tennessee before coming to Belmont to study biology as he was interested in medicine. He was inspired to follow this path because he was convinced in high school that God calls us to serve the needs of others, he said. He went on to medical school at the University of Michigan where he met his wife and four other physician families. He had a vision of a world beyond the borders of America, serving in different cultures, nations and communities. His three dreams were service, working cross-culturally and his wife. Soon after, he and the families he had built a community with moved to Kenya and then found themselves called to Burundi. He described the country as beautiful, but with a history of conflict and instability with more years of war than without it. He also shared that Burundi is arguably the poorest, hungriest and unhappiest country in the world. Where there, McLaughlin and his team were searching for a perfect marriage of need and opportunity. They found these opportunities through training future doctors at Hope Africa University’s Kibuye Hospital. In Chapel, he shared a video with students to help them visualize the organization’s work and mission through its focuses on providing medical care, medical student education and discipleship and hospital development. McLaughlin was introduced by Dr. Todd Lake, Vice President of Spiritual Development.